AUTHOR’S NOTE: Because I, David Chase Taylor, am currently in the process of applying for political asylum in Switzerland, which is coincidentally home to the CIA, none of the terror plots or so-called “natural disasters” I expose come to fruition. In short, the Swiss CIA does not want to afford me any more attention or credibility than they have to, lest they turn me into a modern-day prophet. They also do not want to provide yet another open-and-shut case as to why I deserve political asylum. That being said, there is a wealth of evidence, namely dead Special Forces (e.g., the Terrorgate Scandal), which tend to appear once a respective terror plot is foiled. In order to protect themselves against Truther.org exposing a terror plot which has gone beyond the point of no return (e.g., man-made asteroid attack), the CIA has staged electrical blackouts across Europe (e.g., 2015 Amsterdam Blackout, 2015 Turkey Blackout, etc.) which have set the precedent for a future blackout in Switzerland. Said blackout will only be executed once an irreversible terror plot is exposed by Truther.org at the very last minute. The impending blackout will serve as the necessary cover for a direct attack on Truther.org by the CIA in Switzerland which was exposed globally for the first time in history on March 31, 2015. SWITZERLAND, Zurich — Based on breaking news and events, it appears that the Obama administration (at the behest of the CIA in Switzerland) will attempt to stage domestic terror attacks on federal agents and/or U.S. government-related entities during the armed standoff which is now taking place with the Bureau of Land Management (BLM) in Oregon. The answer to the question posed in the April 17, 2014, Reuters report entitled “After Nevada Ranch Stand-Off, Emboldened Militias Ask: Where Next?” is evidently Southern Oregon. In short, a Bundy Ranch-like Standoff is planned for Oregon with the overall goal of sparking a hot war between so-called patriots and the U.S. government. The notion that a Bundy Ranch-like Standoff is planned for Oregon was first identified back on April 14, 2015, when it was reported that the battle between the BLM and the Sugar Pine Mine could be the next “Bundy Ranch”. Predictably, armed Oath Keepers have been called in to provocateur violence. Similar to Cliven Bundy, Sugar Pine Mine owner Rick Barclay appears to be an undercover agent working on behalf of the U.S. government. Like Bundy, his job is to be the Judas goat, leading well-meaning patriots to Oregon where they will be set-up and/or killed in an attempt to spark a violent revolution against the Obama administration. It is imperative to note that the Oath Keepers organization was specifically created by the CIA in order to spark a civil war in America. In short, its members take an oath to uphold the U.S. Constitution while the Obama administration openly violates said Constitution. Needless to say, an armed conflict is the next step. Back on April 14, 2015, it was reported that tensions between BLM and the Sugar Pine Mine were rising and that the Oath Keepers had set up camp. The camp was created in order to lure well-meaning patriots to Southern Oregon just prior to domestic terror attacks for which they will be scapegoated. In order to show the illegality of the Bundy Ranch, as well as foreshadow domestic terror attacks on federal agents, it was reported on April 15, 2015, that a Cliven Bundy supporter plead guilty to threatening federal official during the Bundy Ranch Standoff. Two days later on April 17, 2015, Raw Story published a report entitled “‘This is Not Bundy Ranch’: Oregon Miners Beg Militia Nuts to Stop Threatening Federal Agents”, linking the two standoffs as well as foreshadowing the notion that federal agents may be attacked in Oregon. In order to demonize farmers and ranchers in Oregon prior to a wave of domestic terror attacks for which they will be scapegoated, it was reported five days later on April 22, 2015, that an Oregon farmer was convicted of killing men and feeding them to pigs. A day later on April 23, 2015, the state-sponsored Southern Poverty Law Center published a report entitled “Oath Keepers Descend Upon Oregon with Dreams of Armed Confrontation over Mining Dispute”. In short, the headline is exactly what the Obama administration has planned— a hot war between armed militiamen and the U.S. government. Less than 24-hours later on April 24, 2015, it was reported that armed protesters have gathered at Bureau of Land Management office in Medford, Oregon over the aforementioned mining dispute. Although only conjecture, it’s highly likely that the BLM office in Medford will suffer a state-sponsored attack. In order to set the precedent for a deadly stand-off in Oregon, it was reported on April 24, 2015, that a gunman died in a shootout after a day-long standoff with police in Salem. The gunman, who was held up in a RV-like bus, was allegedly executed by a SWAT team in a Wal-Mart parking lot. That same day, April 24, 2015, a federal judge tossed out a BLM lawsuit over grazing and water rights by Eastern Oregon ranchers. The timely dismissal of the suit was designed to provide a timely motive for revenge-like attacks against federal agents and/or the BLM. In order to draw unprecedented media publicity to the BLM just prior to a wave of revenge-like domestic terror attacks, it was reported on April 25, 2015, that Oregon County leaders are outraged at the new BLM timber harvest plan. In the aftermath of the Las Vegas Shootings, it was revealed that the suspect Jerad Miller and his wife Amanda were present at the Bundy Ranch Standoff. Since the Bundy Ranch was a gathering of state-sponsored terrorists posing as “patriots”, people affiliated with the Bundy Ranch will continue to be implicated in future domestic terror attacks, possibly even in Oregon. Lastly, in order to foreshadow the notion of a terrorist camp in Oregon, it was reported back on March 30, 2015, that a British man pleaded guilty to U.S. charges that he plotted to set up an al-Qaida training camp on a ranch in Southern Oregon. In the wake of a BLM-related attack, the aforementioned Oath Keepers’ camp will be labeled domestic terrorist camp. In order to create the necessary media narrative for coup-related domestic terror attacks in Oregon, a fabricated e-mail scandal involving former Oregon governor John Kitzhaber was created, ultimately resulting in his resignation. The scandal was evidently fabricated so that bi-sexual governor Kate Brown could be sworn in, providing a perceivably weak and immoral governor. In order to psychologically prepare Oregonians for state-sponsored terror attacks that will predictably be scapegoated onto so-called “right-wing” militia members, a DHS intelligence report warning of a domestic right-wing terror threat was released just two days after Brown was sworn in as governor. The timely report stated that right-wing sovereign citizen extremists who “reject government authority” are now carrying out sporadic terror attacks on police and have “threatened attacks on government buildings”. 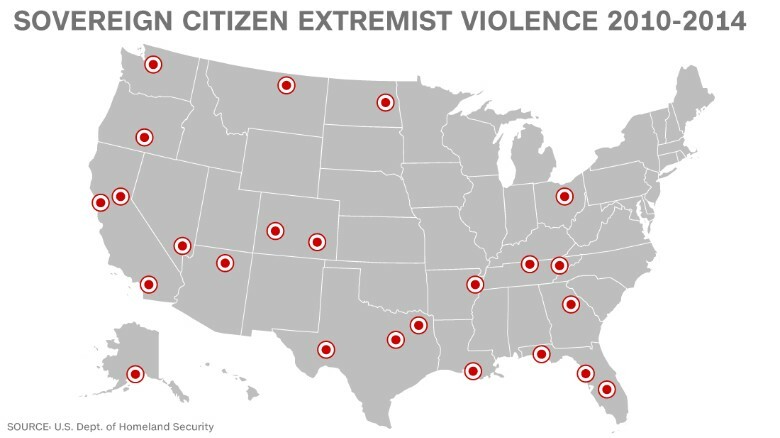 The domestic terror attack map released by DHS coincidentally included alleged attacks in Southern Oregon. In the wake of domestic terror attacks on federal agents and/or U.S. government-related entities, a “right-wing” militia group from Oregon will predictably be scapegoated for the attacks.